Yummy! If it doesn’t wink, blink or move, I’ll eat it. Strange enough that you took the same photos as I did when I was in Vienna, but what are the chances that we hit the same restaurant? 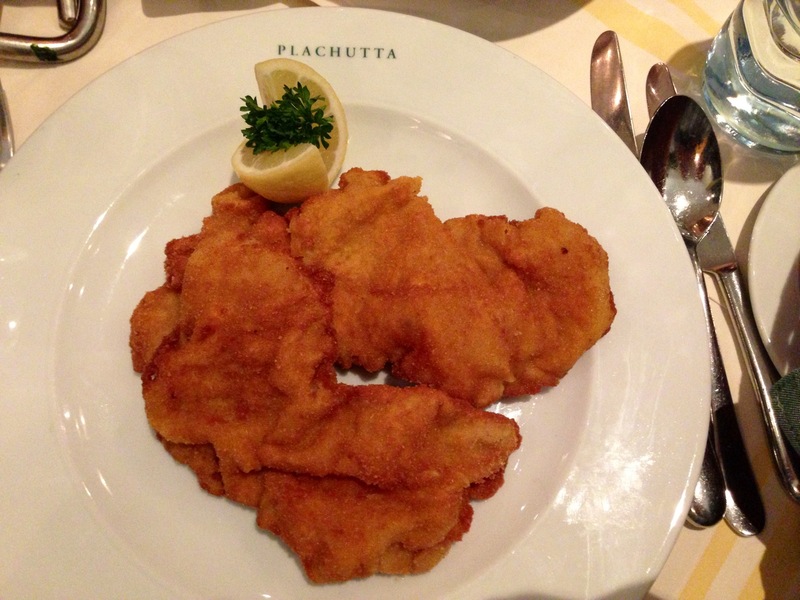 http://www.tripadvisor.ie/ShowUserReviews-g190454-d694560-r133233083-Plachutta-Vienna.html#REVIEWS Freaky! By just looking at the photo you took, here you can see the veal meat wrinkled on it self during the baking. The Schnitzel is rolled on itself some how, in a messy presentation. difficult then to appreciate a mouthful of the meal. Matt you have to come back to Vienna and stop by to http://www.Figlmüller.at . It is not advertising, it is just a fact, they serve you the perfect Wiener Schnitzel. It is kept flat during cooking, because never over cooked neither. Even though the slice of the veal meat is even thinner, It remains largely spread flat presented in a very large plate (as large as a real full italian pizza), so each mouth-pieces of the veal meat can melt easily in your mouth.